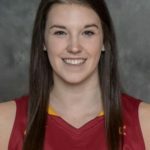 The Iowa State women’s basketball team bids for a trip to the Sweet-16 tonight when the Cyclones play Missouri State in the second round of the NCAA Tournament in Ames. The Cyclones advanced with a 97-61 win over New Mexico State. Missouri State advanced with an 89-78 win over DePaul. A team that opened 1-7 is now a win away from a trip to the regional semifinals. Tip off in Hilton Coliseum is 8:00p.m.